Following on from the explanation of each of the three food groups we will now look at how much of each macro we should be eating. The actual macros I divided I will look at next week, first I want to look at overall calorie intake. The first thing to consider is how many calories overall per day you are eating. This will depend on your height, weight, activity levels and also whether you want to lose, gain or maintain weight. You can then use this number to work out how many calories you should be eating based on your goal. 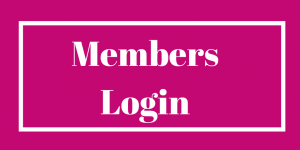 If it is maintenance then obviously it is the number given dependant on your activity. If it is weight loss you are after subtract 15-20% and eat around this many calories and if it is weight gain, add 15-20% more calories to your intake. For example I am 5ft7” and around 64kg. My BMR is around 1400 calories and based my activity I should burn 2100 calories. So for maintenance I would eat 2100 calories, for weight loss I would eat around 1700-1800 calories and for weight gain it would be 2400-2500 calories. Calories are relevant not just as a weight loss tool, but also as a monitor of energy levels and performance. Particularly as I see many professional equestrians who eat very little throughout the day, mucking out, riding several horses and generally being very active and then find themselves extremely tired, aching muscles and perhaps prone to constant colds and infections. This can be caused by a lack of adequate nutrition, as their bodies do not have the fuel required for energy as well as muscle and immune repair. And again, those that say they eat very little and are very active yet still carry extra weight-if they accurately monitored their total intake I would almost guarantee they are overeating. 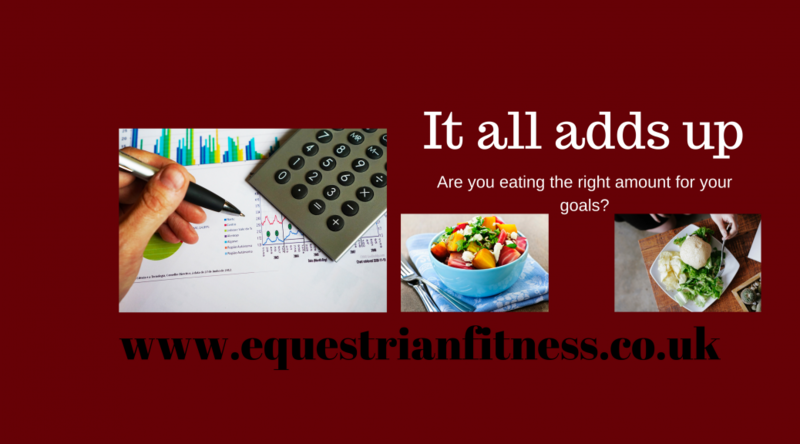 In order to make yourself aware of how much or how little you are eating, I recommend my clients use MyFitnessPal. It is a great app you can get on your phone and basically you record EVERYTHING you eat and drink and it will calculate your calories-it will also calculate your macros hence why it is so useful for next week’s blog when we look at how much of each we should be eating. So I want you to do that this week, whether you are looking for a change in weight or not, download the app and get used to recording your food and then you will have an idea of how many carbs, fats and proteins you eat already and monitor how those current numbers make you feel energy and health wise. We have 2 spaces available in our Tuesday evening 7.30pm class at the studio based WN8 9QP. Let me know if you would like to join us! Ok, so last Macro Nutrient this week’s Fats. Fats have definitely had plenty of bad press over the years, and it is not warranted. We shouldn’t avoid eating fats at all, they are vital for a healthy body it’s just about eating the right kind of fats. Fats are made up of chains of Hydrogen and Carbon called Hydrocarbons. The arrangement of these Hydrocarbons determines the type of fat, which are broken down into 3 categories. Polyunsaturated Fat. (Further broken down into Omega 3 and Omega 6). Fat of all 3 types are important to our overall health. It provides the aforementioned Omega 3 and 6 Fatty Acids that the body cannot make itself. Most of the bad rap for fats has been aimed at Saturated Fats. However this is slightly unfair and where common sense should apply. In reality people will quite often consume Saturated Fat alongside high sugar intake and refined carbohydrates –think takeaway and doughnuts…. Suddenly Eggs and Steak are getting the blame for health issues such as high cholesterol associated with a high level if saturated fat. In fact foods such as red meat and eggs contain as much and often more monosaturated fats than saturated fats. As with any part of the diet the devil is in the dose and all 3 kinds of Fats should be consumed but none should be over consumed. If you are eating fresh, whole unprocessed foods as 80% of your diet you probably don’t have anything to worry about with regards to your fat intake. To ensure you are getting enough healthy fat sources try including these sources into your diet regularly. Oily Fish such as Salmon, Mackerel. Try and eat at least one portion a week. Coconut-Coconut Oil has become popular to cook with and add to smoothies and porridge as an easy way to add healthy fat to your diet. 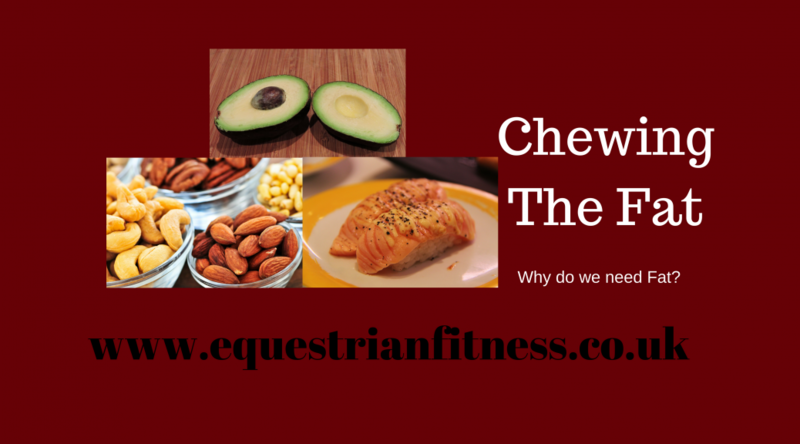 As Equestrians we need high energy levels and good cognitive function –that’s brain power to remember your Dressage Test; a healthy Fat intake can help you with that. Your homework this week then is to have a look at your Fat intake. If you don’t already try adding one healthy fat portion to your diet every day next week maybe just an egg, some fish or a handful of nuts and see that brain power rocket! Thanks to everyone that replied last week to let me know about the new carb sources they have been adding to their diet and to those that weighed their suggested serving of pasta-Carbs aren’t the devil we just find it too easy to over eat them! On to this week, we move on to Protein. When I say Protein most people picture meat heads at the gym downing shakes but protein is found in many everyday foods. Protein is vital for repair of the body, not just repair from injury or after heavy exercise but also the day to day constant regeneration of organ tissue, muscles, tendons and ligaments; and every other part of your body down to hair, skin and nails. As equestrians the daily dealing with horses means we generally take a bit of a battering. Whether that is mucking out, carrying feed, riding or being dragged through mud by a wayward horse we are usually subject to some manual labour and some general pushing and shoving-all the unexplained bruises???? 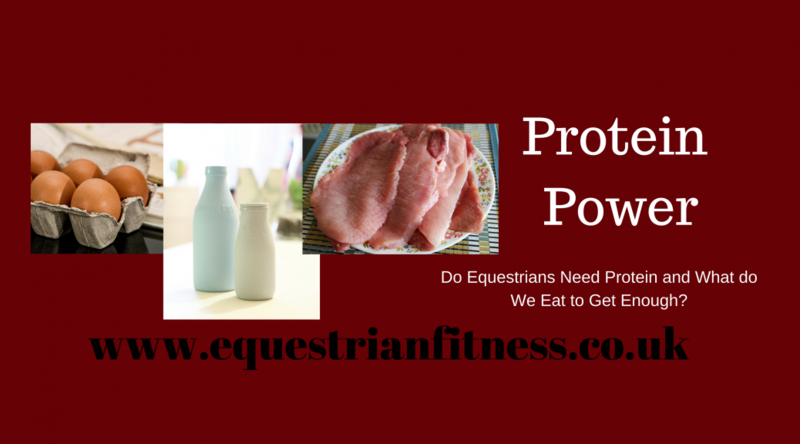 So, in short we need protein, and if you do lead a fairly active lifestyle then you need a little more protein to enable your body to adequately recover. I’m going to talk more in detail about how of each macro nutrient we require in a few emails time so don’t worry about that too much for now. However I do want you to be more mindful of how much or how little protein you do eat. To make sure you are eating enough aim to have a serving at every meal. Maybe if you switched to porridge at breakfast you would be adding milk (plant based milks have a little less but Soy is your best option of you are Vegan/Vegetarian). Or perhaps you could have eggs for breakfast? If you do rush out the door without eating why not make a protein shake (you can buy any brand it doesn’t have to be over priced with “magic” properties) and add some milk, a banana or other fruit, a spoonful of peanut butter and maybe even some cacao powder. Lunch and Dinner time the options are many and varied; add Meat or Fish/Seafood to salads and veg, make a bean or lentil chilli, casserole etc. It’s really easy to get some decent protein into your lunch and evening meal. If you think you might need a bit more, then having yoghurt, cottage cheese or boiled eggs as snacks work well, as do aforementioned protein shakes. 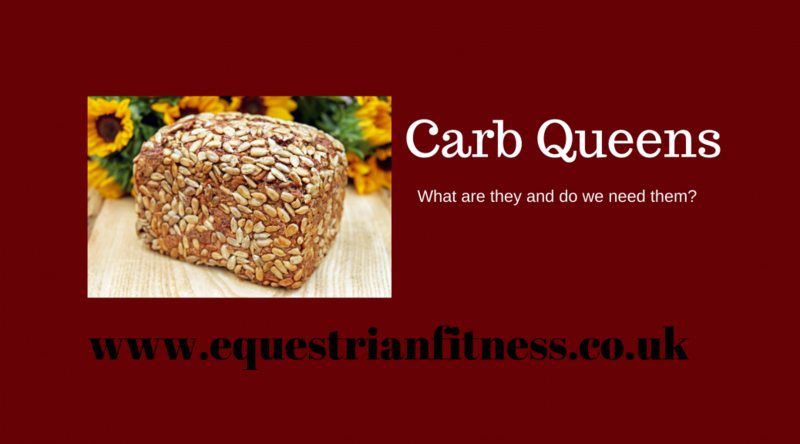 So, we nailed carbs last week, this week I want you to start looking at your protein intake. Do you eat a serving at every meal? Make it your mission this week to start now. Wow so last week’s email got a lot of replies from you guys all agreeing that shake diets are not the way forward for us active equestrians. It’s awesome to know we are on the same page. I also got many requests to talk about nutrition some more. So here goes! Whether you’re an avid foodie or not the reality is that food is fuel for our bodies. The more good stuff we put in the more good stuff we will get out of it. I imagine you thought long and hard about your horse’s diet, did lots of research perhaps even spoke to a nutritionist. You then monitor how he looks, feels and performs on that diet and if something isn’t quite right you tweak it to make it right. For yourself I imagine nowhere near as much thought goes into your diet! Obviously for us it’s slightly different in that we don’t want or need to eat the same thing day in day out to stay healthy. What we do need though is a well-balanced diet, containing all the right macro and micro nutrients that are vital to rebuild and repair our bodies on a daily basis. I’m going to keep this simple and break it down over the next few weeks. So, let’s start with Macro Nutrients. These are the basic 3 food groups that we need to provide us with energy in some way. They are broken down as Carbohydrates, Fats and Protein. Let’s start with Carbohydrates this week. Carbohydrates are Sugars, Starches and Fibre which are broken down by our digestive system and released into the blood stream as Glucose to be used as energy for our activity levels, brain and nervous system. So think about what systems you are using in your body when you ride. You want to be alert-so that’s your brain, you want to be able to react quickly so that’s your nervous system and you of course want to have the overall energy in your body to ride! Grains-Wheat, Oats, Rice, Quinoa etc. Most people picture bread, potatoes and pasta when they think of Carbs. And there is nothing wrong with these as carb sources we just get a little stuck and end up over eating them. *Tip. Weigh out the suggested portion size of pasta next time you cook and you may be very surprised! This is why low carb diets seem to be a holy grail-it is not the reduction of carbs that has made you lose weight it is the reduction in calories when you take out these things and replace them with lower calorie alternatives. However along with that reduction in carbs comes lethargy, a reduced immune system and potential muscle loss as your body uses muscle building protein for energy. So, I want to challenge you this week to try and mix up your carbs a bit. Eat coloured fruit and/or vegetables at every meal. So berries in those oats, broccoli, carrots, peppers etc. in your lunch and dinner. Try a grain and/or bean you have never eaten before. Maybe try Teff or Freekah (you can get them in the supermarket I promise) with a lunch salad or make a Chilli with some different kinds of beans added. I’d love to hear how you get on with your experiments! Next week we will look at Protein.